I'm going to kick off this review by comparing these pancakes to a cereal we reviewed earlier this year. First, they're both for breakfast. Second, we prepared both of them with milk (although the instructions for these pancakes said to just add water). Thirdly and most importantly, they were both just too gingery for us. Or rather, certain bites were just too gingery for us in both cases. The ginger bits in the batter had a tendency to sink down to the bottom of our mixing bowl, so the first few pancakes we made were just like regular flapjacks but with a mild to moderate gingerbreadishness about them. Really pleasant overall. With butter and maple syrup, they tasted really good, and the gingerbread vibe was a nice holiday twist. However, the last few pancakes had at least one hunk of "crystallized" ginger in every bite. You can chalk it up to user error and say we should have fluffed up the batter a bit before each pancake hit the skillet—and in hindsight, that might have solved the problem. But even then, I think there would have been too much ginger. 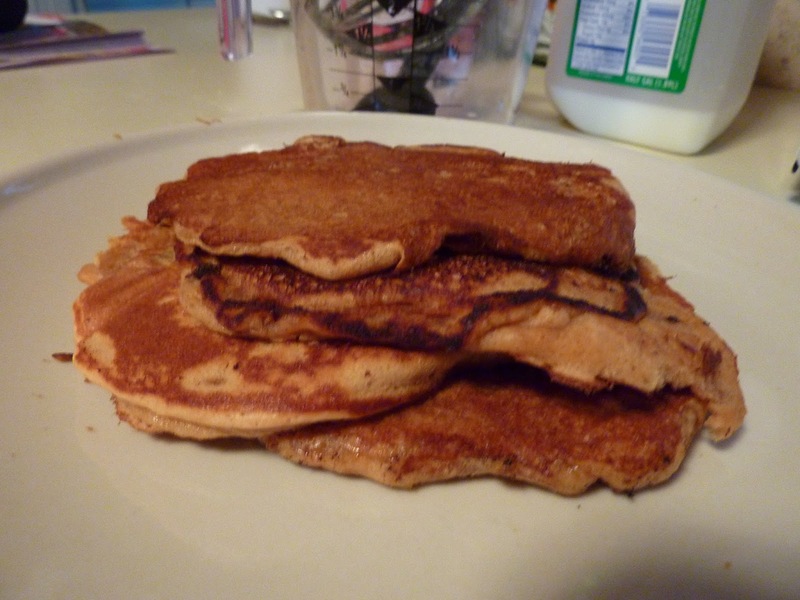 It might have been a blessing in disguise that the first half of our pancake batch was relatively ginger free. Because the ones with ginger were WAY too gingery, even dressed up with butter and syrup. Each ginger chunk was about the size of the piece of pimento you might find in an olive. That might not sound very big, but the flavor of ginger is so potent, it overshadowed everything else. We were expecting something that tasted like gingerbread, not raw ginger. Ginger's great as a spice, but it's just too much for Sonia and I when it becomes the main attraction. 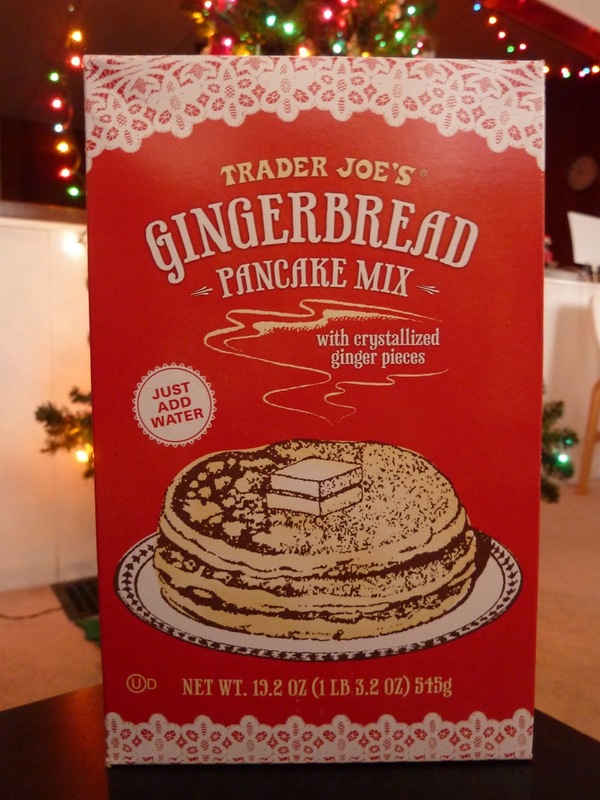 This pancake mix isn't a complete fail, in my opinion, but you really have to love the taste and texture of actual ginger for them to be considered a win. Sonia's only other comment: "Not terribly impressed." She gives them 2.5 stars. I'll be the slightly less grinchy Grinch this time and give a 3.5. Well, that's disappointing...but it gives me an idea of how to gingerize my Pamela's gluten free mix: add some molasses for extra sweetness, a splash of vanilla extract, and then ground ginger, clove, cinnamon and nutmeg. They gave these for free samples, and I thought they were pretty good! How do these compare to the coconut pancake mix? Russ and Sandy actually reviewed the Coconut Pancakes. Sonia and I haven't tried them yet, Diya. Oh whoops! Both of you have similar writing styles! Just wanted to stop by and tell you about the new quinoa pesto Trader Joe's just came out with. My friend works at our local store and she brought me a sample jar to try and it's SO delicious. I can't stop thinking about it!! Quinoa pesto. Copy that. Thanks!